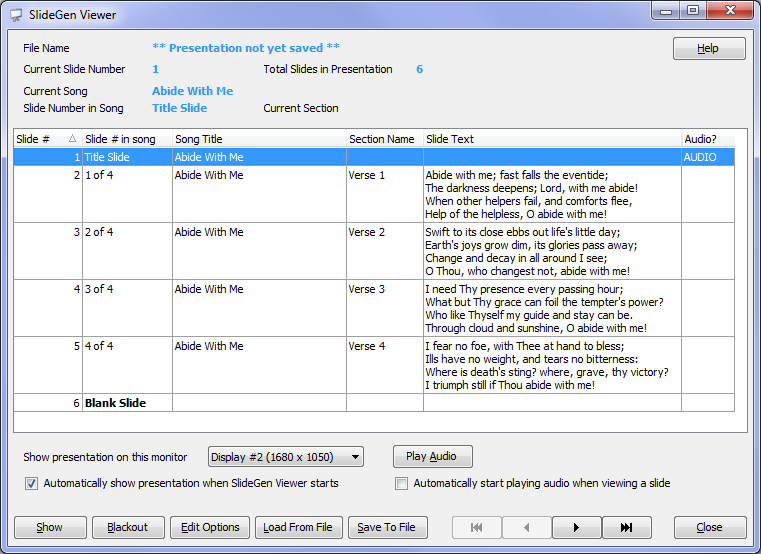 The SlideGen Viewer is available as a standalone application, or is launched from within the main SlideGen application. Launch menu - by selecting Go | Launch SlideGen Viewer from within the main window. This launches the standalone version of the SlideGen Viewer. From the Windows Start menu - you can launch the SlideGen Viewer by selecting SlideGen | SlideGen Viewer from the Windows Start menu, but only if you have run the separate installer for "SlideGen Viewer Setup" available from the SlideGen download page. By double-clicking SlideGen Presentation - you can always launch the SlideGen Viewer by simply double-clicking on a SlideGen Presentation that you have previously saved to a file. This help page relates to the version that is launched from within the main SlideGen application (the first two options above). However, most of the functionality is the same as for the standalone version - the main difference being that the standalone version also has a main menu, but does not include audio capability (see more on audio below). The current slide can be changed by selecting the appropriate entry in the slide listing (i.e. the grid listing). The details of that slide are shown at the top of the screen. A help button is always available in the top-right, which will bring you to this help page. You can edit the lyrics for a slide (e.g. to correct any spelling mistakes, etc...) by right-clicking on the slide in the slide listing and selecting Edit Slide. You can also hide a slide by selecting Hide Slide from this same menu. If you wish to automatically show the presentation when SlideGen Viewer starts, you can select the checkbox "Automatically show presentation when SlideGen Viewer starts". This will take affect the next time SlideGen Viewer is launched. To start showing a presentation, click the Show button. See below for details about showing a presentation under different modes. To edit the presentation options (e.g. background colours, fonts, etc...) click the Edit Options button. To load a new presentation into the viewer, select Load From File. To save any changes made to the existing presentation, select Save To File. If you launch the presentation from within SlideGen, you will also have access to the Audio Track for a song, if one is defined (see Managing Audio Collections for more details). The "Audio?" column in the grid will say "AUDIO" for the first slide in a song if audio exists for that song. To start playing the audio for this song, click on the "Play Audio" button. Once the audio is playing, the caption for this button will change to "Stop Audio" - allowing you to stop the audio at any time. "Auto Advance Turned ON" (in green) - this means that SlideGen knows the timings for this song, and will automatically advance the slides for this song at the correct time. After a few seconds, a timer will show, counting down to the next slide change. If you click or move to any slide while this is happening, the "Auto Advance" feature is automaticaly turned off, and you will need to manully advance to each remining slide. If you want SlideGen to automatically start playing the audio for a song when the first slide for that song is selected, select the checkbox "Automatically start playing audio when viewing a slide". Note: the Auto Advance feature will still work if you've removed one or more verses for a song within a presentation, but it will not work (will be disabled) if you've done anything more than that (like add a repeat of a refrain). When removing verses, SlideGen will drop the corresponding number of verses from the audio. It does this by commencing partway through the audio track - e.g. if you've only selected two out of three verses for a song, SlideGen will start the audio towards the end of the first verse, and use the end of the first verse as the introduction. Singing will commence at the second verse in the audio (even if you've selected verses 1 and 3 in the lyrics). To show a presentation, click the Show button. If you only have one monitor (e.g. you are using "clone" mode on a laptop) then the presentation will fill the entire screen, and you will not have access to the SlideGen Viewer window. To operate the presentation, use the following keyboard shortcuts, or right-click with the mouse anywhere on the presentation area and select an option from the menu. To show the presentation in multi-monitor mode, make sure the SlideGen Viewer window is not on the presentation monitor. Move (drag) it to a different monitor if necessary. Then select the presentation monitor in the drop down "Show presentation on this monitor". If you are not sure which monitor is which, find out via trial and error. Then click the Show button to begin the presentation. You should now have the presentation itself on one monitor, and still have the SlideGen Viewer accessible on another monitor. You can control the presentation by using the keyboard shortcuts above (you may need to click on the presentation to make it the active window), or you can control it by navigating the slides using the SlideGen Viewer window. Move to Next Slide - click the right arrow button in the button bar to the left of the Close button, or select the next slide in the slide listing. Note that once you have selected a slide in the slide listing, you can use the down arrow on the keyboard to move to the next slide. Move to Previous Slide - click the left arrow button in the button bar to the left of the Close button, or select the previous slide in the slide listing. Note that once you have selected a slide in the slide listing, you can use the up arrow on the keyboard to move to the previous slide.